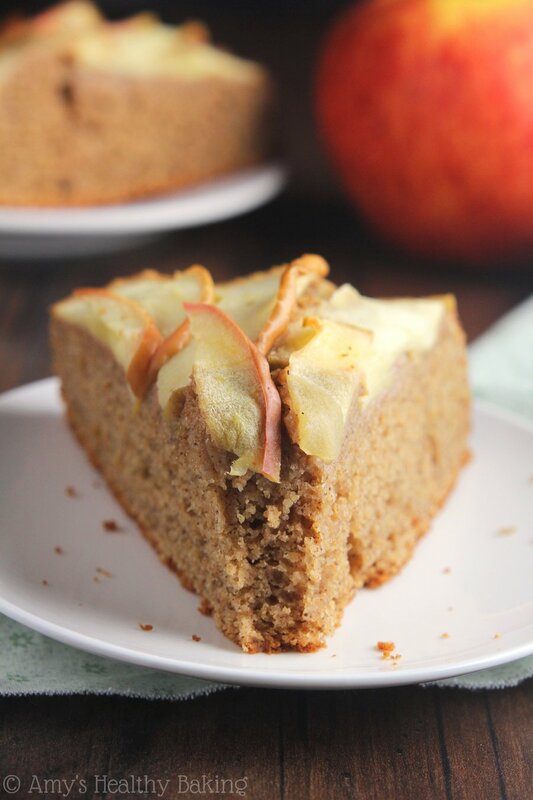 A tender cake full of cozy spices and topped with fresh apple slices. It looks stunning and impressive, but it’s really easy to make and healthy too! Last week, my guy attended a conference in sunny San Diego, and I tagged along to visit my grandparents. Since his conference’s sessions always run all day and late into the night, leaving almost no room in his schedule to socialize or explore, we arrived a day early to do a few touristy things (my guy had never been to the area before!) and spend some quality time with my grandparents. Because my family used to come down to visit at least once a year, I let my guy decide what we would do. His eyes lit up when my grandparents and I mentioned the zoo, so we drove over to walk around the park, take pictures of the exotic animals, and collect a few souvenirs. We love those penny-press machines that flatten and stamp a picture onto coins, and there were lot of image choices all around the zoo! Seeing as I’m slightly directionally-challenged, my guy took charge of the map and led us all around the enclosures. We started with the bears at the front of the park, worked our way up past the pandas and bald eagles and zebras until we reached the polar bears (the #1 animals my guy wanted to see! ), then back around to the lions (holy moly, those cats are massive!) and elephants, and finally back around to the empty penguin exhibit (my favorite animals… I was sad they were gone!). Before we started our safari-like trek, we failed to realize one thing… The zoo is shaped like a massive bowl! It dips really far down in the center with corresponding smaller hills around the outer rim as well, so our legs worked much harder than we anticipated in the hot afternoon sun marching up and down and all around the park. By the time we left, we thought a relaxing evening at home sounded perfect! So we all could spend most of the night lounging on the comfy sofas and chairs in the living room catching up on life and chatting about the day, my grandparents kindly picked up groceries from the store down the street to cook an easy, laid-back dinner with minimal prep. Grandma tossed chicken, steak, and mixed veggie kebabs on her indoor grill before heating creamy mashed potatoes and cinnamon apple slices to serve on the side. Other than in pies, crumbles, and cobblers for dessert, I had never seen warm cinnamon apples served at the table for dinner. Maybe I’m just behind the times, but that serving bowl emptied faster than the other side dishes or entrée platter because everyone reached for seconds. Grandpa may have even snuck a third serving later! 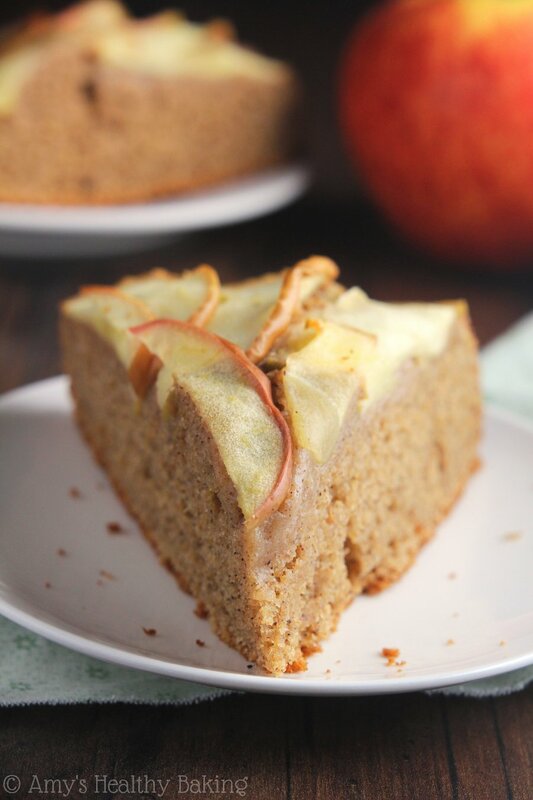 That sweet side dish served as the inspiration for today’s recipe, this Simple Cinnamon Apple Cake. 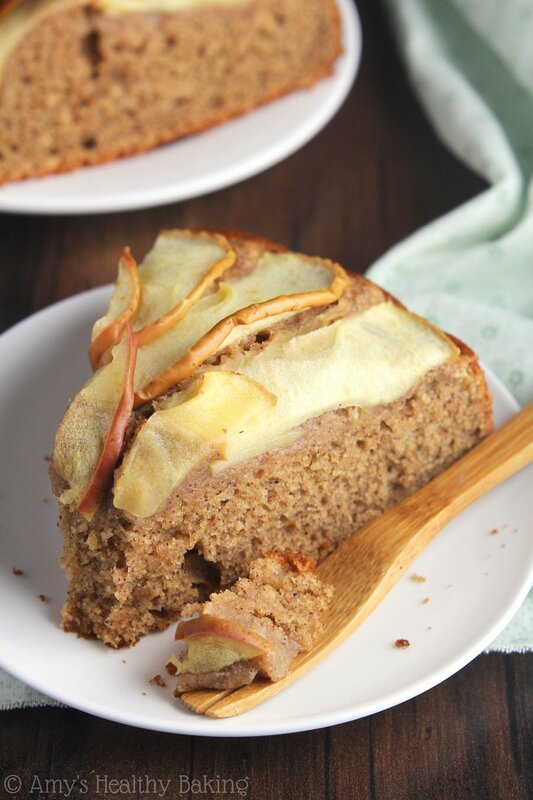 Full of the same warm spices as my favorite zucchini bread, it tastes like cozy comfort food in every slice. It even looks impressive enough for a special occasion, but it’s incredibly easy to make! 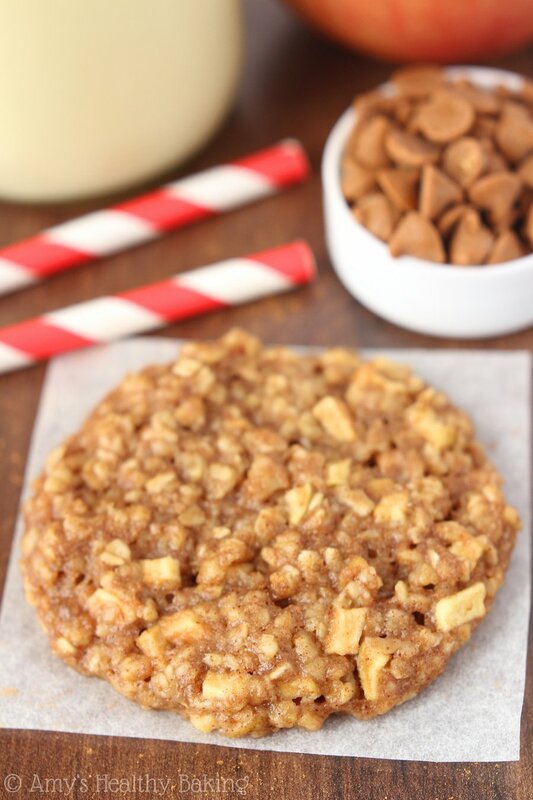 This recipe starts with white whole wheat flour. White whole wheat flour is made from a special type of white wheat, which lacks the pigment of “red” wheat that regular whole wheat flour is ground from. 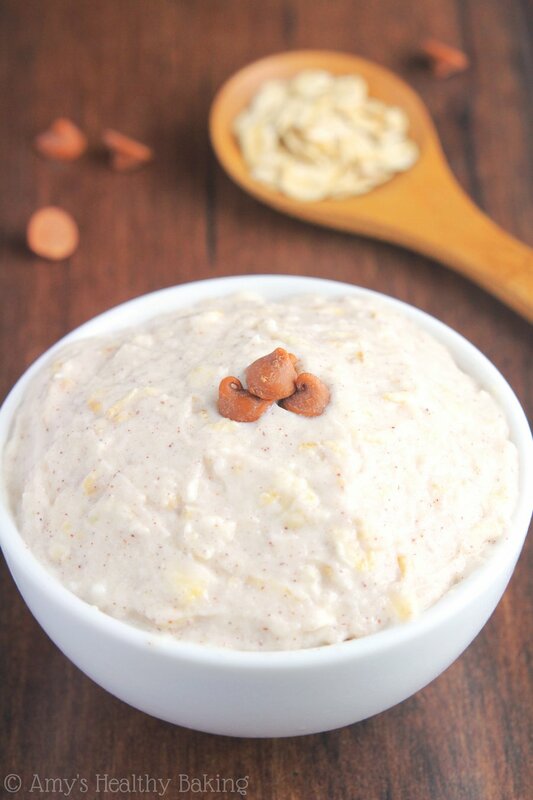 It has a lighter taste and texture, making it perfect for baked goods like cakes and pastries. Most grocery stores (including Walmart) stock white whole wheat flour on the baking aisles, but whole wheat pastry flour would be a great substitute if you can’t find it. As for the spices, I’m obsessed with cinnamon and nutmeg right now. They pair perfectly with apples and provide that irresistible warm, cozy backdrop reminiscent of fall. 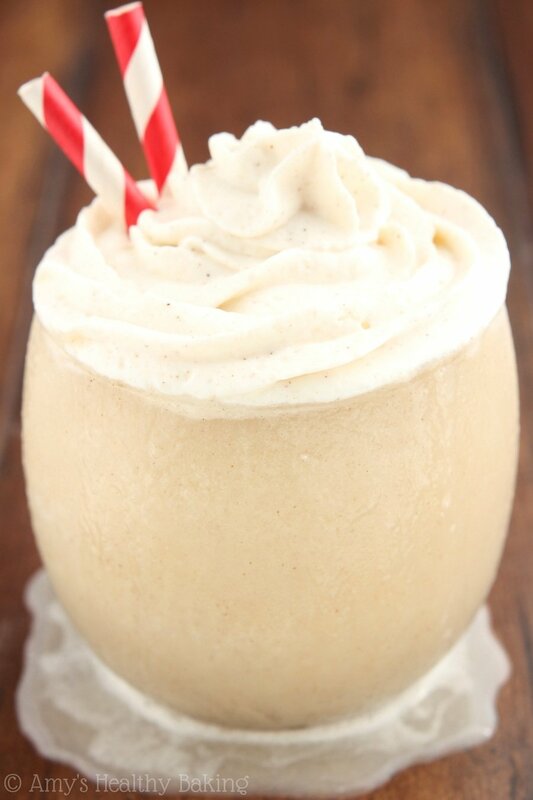 Although the cinnamon flavor is more prominent, the nutmeg still adds an important deeper richness, so don’t skip it! This entire cake only contains 1 tablespoon of butter, so the rest of its tender texture comes from my favorite ingredient in healthier baking: Greek yogurt. Greek yogurt provides the same moisture as extra butter or oil for a fraction of the calories, and it adds a little protein boost too. 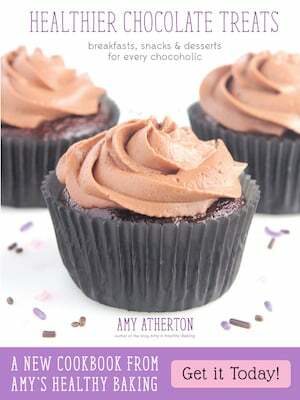 I include it in the majority of my recipes, from cupcakes and muffins to frosting and parfaits! For the pretty fruit topping, I sliced an apple to between ⅛” and ¼” thick. We want the slices to be thin so that they soften while baking and are easier to cut through. 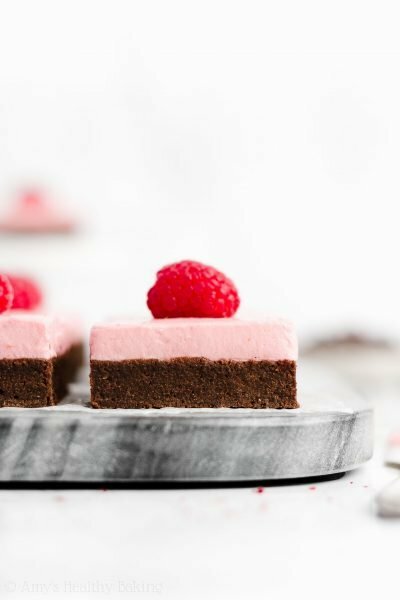 Thicker slices would stay crunchy, even after baking, and would be much harder to slice through when carving pieces of cake to serve! To ensure that didn’t happen, I also popped the apple slices into the microwave for a tiny bit to soften them slightly before arranging. They don’t have to be perfect! Just start laying them around in a circular shape. I started with the outside ring first before moving on to the inside, and I gently pressed each slice into the batter to ensure it stuck. Then place the pan in the oven and set your timer! Here’s my trick for cutting pretty slices of this cake: use a serrated bread knife. 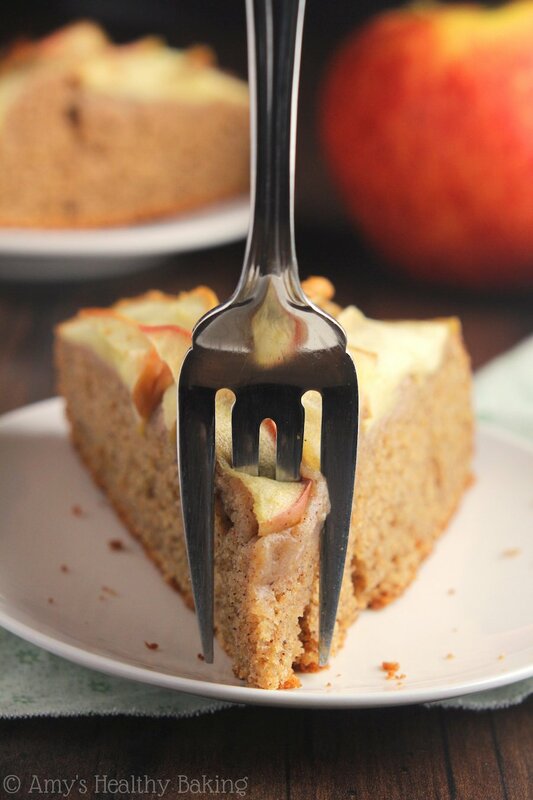 The serrated knife cuts through the apple slices better than a standard chef’s knife, so the fruit won’t end up sliding off onto neighboring pieces of cake as much. 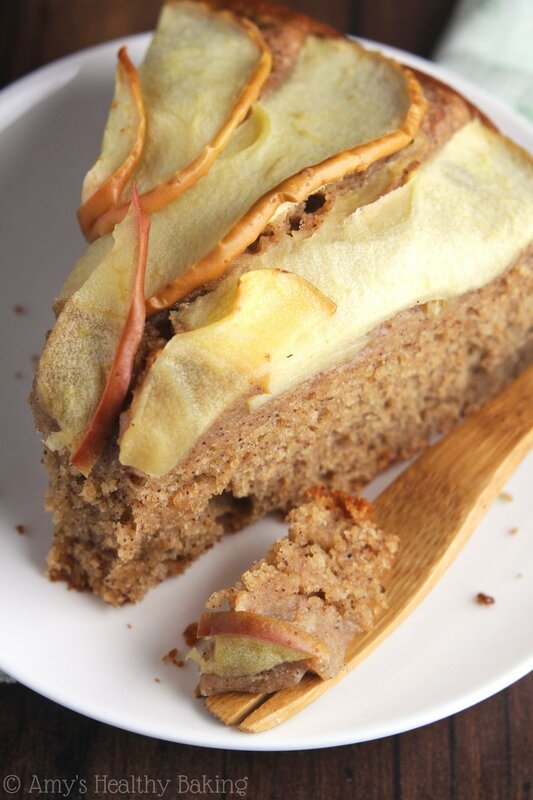 This tender cake is full of cozy spices, and the beautiful sliced apples adorning the top give it a sophisticated look. 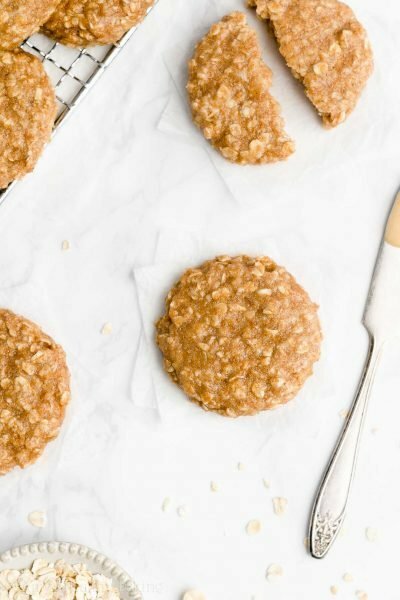 But don’t be fooled—it’s still really easy to make! Leftovers will stay fresh for at least 3 days if stored in an airtight container in the refrigerator. Preheat the oven to 350°F, and lightly coat a 9”-round springform pan with nonstick cooking spray. Place the apple slices in a microwave-safe bowl, and cover the top with plastic wrap. Microwave on HIGH for 1 minute 45 seconds. Carefully remove the plastic wrap, and set aside. Spread the batter into the prepared pan. 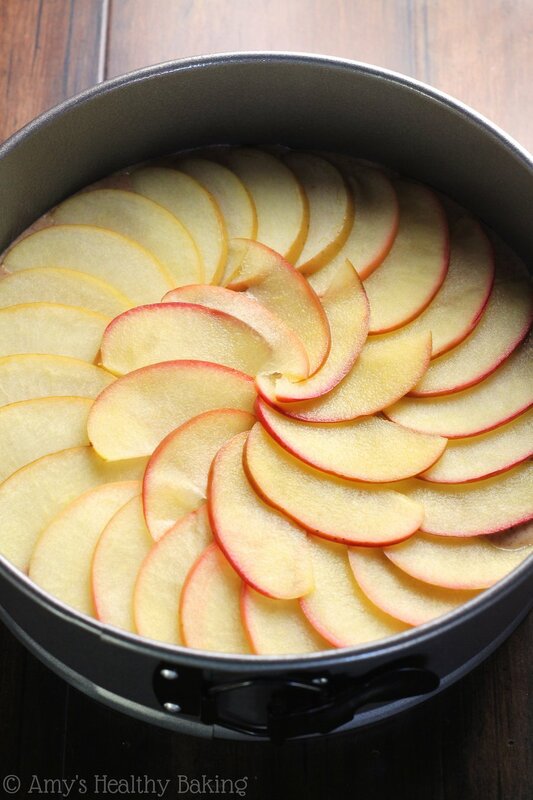 Arrange the apple slices in a circular pattern, beginning with the outer rim before finishing with the interior, and gently press each into the batter. (See the photos in the blog post above.) Bake at 350°F for 45-50 minutes. Place the cake pan onto a wire rack, and let the cake cool in the pan for 10 minutes before removing the sides of the pan. Let the cake cool completely before serving. 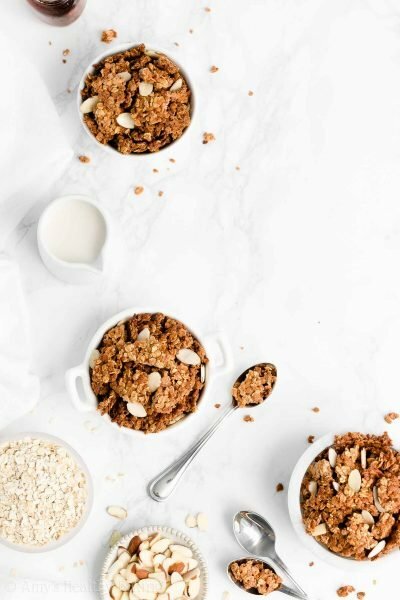 Notes: For the gluten-free flour, I recommend the following: 1 cup (120g) millet flour, ½ cup (60g) tapioca flour, ¼ cup (30g) brown rice flour, and 1½ teaspoons of xanthan gum. I have not tried any other gluten-free flour blends and cannot guarantee that they will work. Whole wheat pastry flour, regular whole wheat flour, and all-purpose flour may all be substituted in place of the white whole wheat flour. If using regular whole wheat flour, the cake will have a slightly denser texture. If you do not have a springform pan, use a 9”-round cake pan instead, and line the inside with foil before coating with cooking spray. After letting the cake cool for 10 minutes, carefully lift the cake out of the pan by holding onto the foil, and let it cool completely on a wire rack. For best results, slice the cake with a sharp serrated knife. Hi!! This looks great! We don’t use a microwave, could I boil the apple slices instead? Or do you recommend something else? Thank you! I really appreciate your interest in my recipe, SJ! You can cook the thinly sliced apples on the stove over medium-low heat in a pan lightly coated with cooking spray, stirring frequently, until they’re fork-tender but not completely falling apart. 🙂 I can’t wait to hear what you think of the cake! Can we use stevia? Ration 1:2? I guess i might need to adjust the liquids? I would appreciate your recommendations! 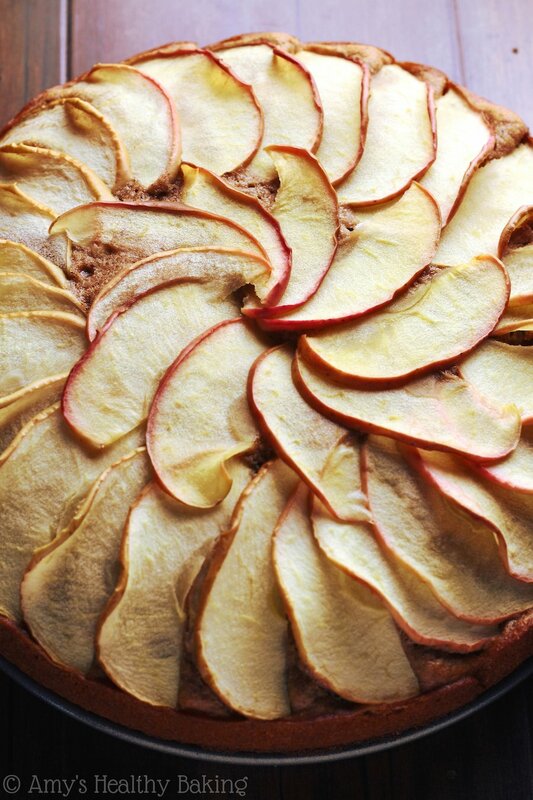 Wondering if you could dice and cook the apples and add them to the batter. Or would that throw off the consistency of the cake? Looking to make this for my daughters birthday. 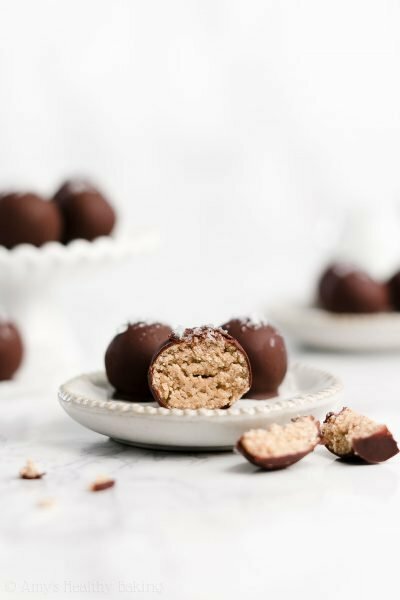 I’m truly honored that you’d consider making one of my recipes to celebrate such a special occasion! That means the world to me Rachel! 🙂 Yes, you can definitely dice the apples and add them to the batter instead! I recommend cutting them to be no larger than the size of chocolate chips to ensure the cake bakes evenly. (I know that takes a bit more time and effort, but I promise it’s worth it!) 🙂 I’d love to hear what you and your daughter think if you decide to make this cake! And happy birthday to her! 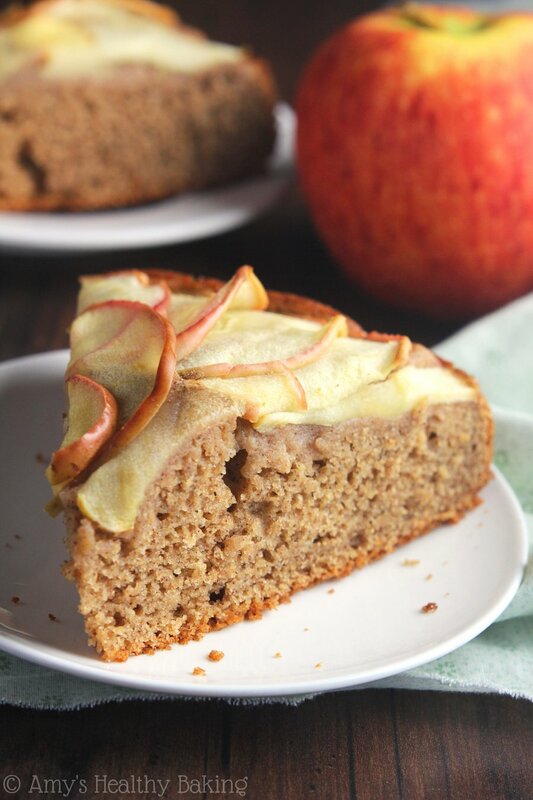 What a deliciously easy cake and so very pretty with the apple slices! I used Pillsbury Gluten Free flour and opted for Coconut Oil over butter. Results were fantastic! Thank you Amy. 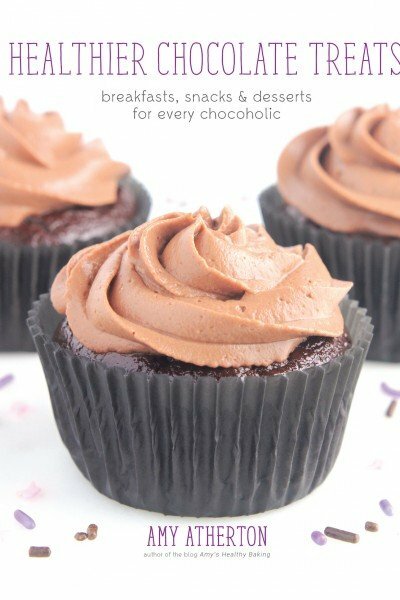 This is the first recipe I made from your awesome website. Looking forward to making many more! I’m so glad you enjoyed this cake Maria! That means the world to me that you’d want to try more of my recipes — I’m truly honored! 🙂 I can’t wait to hear what you decide to make next!